Peter Laviolette understandably wants to take things slow in the first month of his first regular season as coach of the Nashville Predators. He wants to ease his foot onto the gas pedal so to speak, but with the mindset that points are already at a premium in the Central Division. "The points are so important," Laviolette said following Nashville's 4-3 shootout win against the Arizona Coyotes on Tuesday. "In your division you've got to keep winning, got to keep collecting points." The Predators have been, to the tune of a 4-0-2 record through six games. 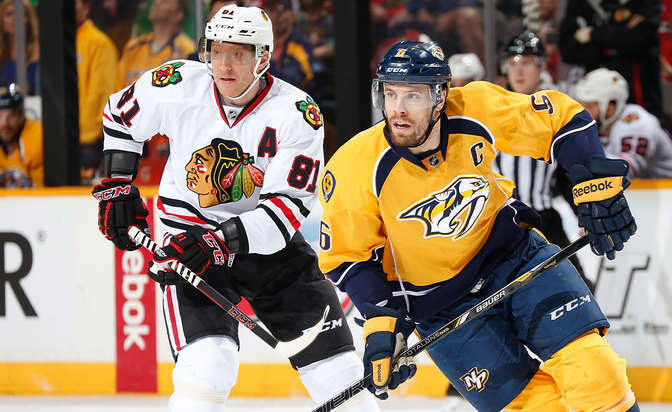 They've got a chance to collect two more points Thursday against a Central Division rival, the Chicago Blackhawks, at Bridgestone Arena. There's no question the Predators are a work in progress, especially considering goals haven't come easy and their power play hasn't quite clicked yet. They were 18th in the League in goals per game (2.50) and 26th in power play (9.5 percent) entering Wednesday. 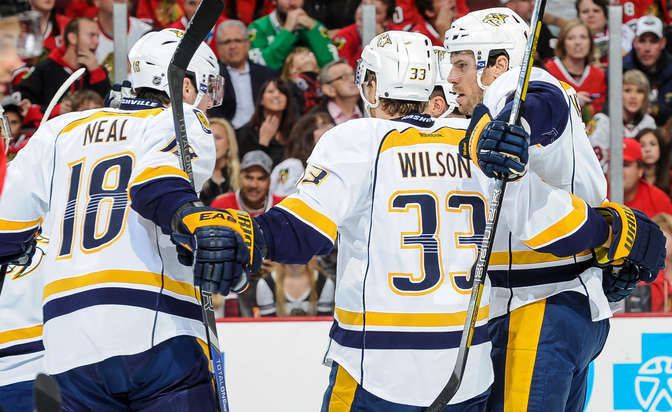 However, the Predators also are off to the third-best start in franchise history with a chance to build on it against the Blackhawks. They won eight in a row to start the 2005-06 season and didn't have a regulation loss until their ninth game of the 2010-11 season (5-0-3). "The start has been good," Laviolette said. "We kind of went slow with things, talked about the first game and when we wake up tomorrow we'll talk about the next game. But the guys have played hard. They've fought. When things have gone well they continue to push. When things haven't gone well they try to do their best to get things going in the right direction." Nashville general manager David Poile wondered after last season if the Predators would have made the Stanley Cup Playoffs had goaltender Pekka Rinne been healthy. It was understandable considering Nashville missed the playoffs by three points and didn't have its No. 1 goalie for more than five months. Rinne is one of the top goalies in the NHL, a two-time Vezina Trophy finalist, but he was out for the majority of last season because of hip surgery and a subsequent infection. He's back, healthy, and is it possible that he's better than ever? That remains to be seen because five starts is too small of a sample size to judge, but Rinne's results have been spectacular and the biggest reason why Nashville is off to a strong start. He has a 1.55 goals-against average and .940 save percentage in five starts. He has allowed eight goals on 133 shots and had a 31-save shutout against the Winnipeg Jets. He has allowed four even-strength goals. In his one start this season, backup goalie Carter Hutton made 35 saves against the Blackhawks, allowing shorthanded goal by Jonathan Toews in overtime, the difference in a 3-2 loss. Next to the goaltending, Predators captain Shea Weber and his defense partner, Roman Josi, might be the biggest reason for Nashville's early-season success because of the minutes they play, the competition they face, and the results they're getting. Weber and Josi are playing almost half the game and always against the opposition's best forwards. They start the majority of their shifts in the defensive zone and have sub-.500 Corsi-for percentages, but they haven't been on the ice for an even-strength goal-against since Ottawa Senators center Kyle Turris scored the first goal of the season against Nashville 1:15 into the second period of the season-opener Oct. 9. Weber and Josi are a combined plus-8. It's obviously not surprising Weber is off to a strong start. A Norris Trophy finalist last season, Weber is averaging a Predators-high 28:45 of ice time (second in the NHL behind former teammate Ryan Suter). In that time he has scored three goals on 18 shots and has a plus-5 rating. It shouldn't be a surprise Josi is playing well despite averaging 28:23 of ice time per game, which is third in the NHL behind Suter and Weber. He had 13 goals and 27 assists in 72 games last season, when he averaged 26:25 of ice time per game and 30.3 shifts per game. When the Predators lost Suter to the Minnesota Wild more than two years ago there was concern they wouldn't have anybody to replace him. There's no concern anymore because of Josi. The Predators have been tracking well under Laviolette since the start of training camp. The 2014-15 NHL season is underway, so NHL.com has you covered with weekly fantasy hockey positional rankings, real-time spin updates and waiver wire advice. He wants them to push the pace, to play fast, be aggressive, skate and have the puck. They are doing all of those things. Maybe not as consistently as Laviolette would like, but enough to contribute to wins when you also factor in the goaltending they're getting. Take, for example, Mike Ribeiro's goal against the Arizona Coyotes. Coyotes center Antoine Vermette shot the puck wide, off the end boards. It caromed out to the half-wall, where Arizona defenseman Oliver Ekman-Larsson fell down, allowing Ribeiro uncontested possession. But just as he got the puck, James Neal, Filip Forsberg and Ryan Ellis busted out of the zone and joined him for what turned into a 4-on-1, with Ribeiro finishing it off. Neal's tying goal later in the game provided a different example of how Laviolette wants the Predators to play. They forechecked, created a neutral-zone turnover, quickly got the puck into the zone and wasted no time getting off a shot, a one-timer from Neal off a pretty backhand feed from Ribeiro. The Predators are executing in Laviolette's up-tempo system. The Predators are an even team in the first 40 minutes of games; they are a dominant team in the third period. Considering they have entered the third period tied or trailing in five of their six games, their timing couldn't be better. Despite being outshot 59-58, Nashville has outscored the opposition 8-2 in the third period. They were trailing 1-0 entering the third period against Ottawa, but won 3-2. They were tied going into the third period against the Dallas Stars, Calgary Flames, Blackhawks and Coyotes, and earned six of eight possible points in those games. Poile wasn't sure, and still might not be, of the impact Forsberg could have this season. He's a high-end prospect, but the question was, is he ready to play top-six minutes in the NHL? The answer remains unknown, but Forsberg is at least making his case and helping the Predators in the process. He has one goal, four assists and 12 shots on goal in six games. Forsberg started the season with a four-game point streak but has gone without a point in the past two games. Laviolette showed confidence in Forsberg on Tuesday, when he played him a season-high 19:06, including 6:09 on the power play. Forsberg is playing on the Predators' top line with Ribeiro and Neal and doesn't look out of place. The Predators acquired four forwards in the offseason that were brought to Nashville to lead the offense. Three of them have done just that. Ribeiro leads Nashville with three goals and five points. Derek Roy leads with four assists. Neal leads with 20 shots on goal and has two goals in the past three games after being shut out in the first three. Olli Jokinen, the other new addition up front, has struggled and has no points.